In an increasingly interdependent world, a prosperous future requires education systems that educate for global citizenship. We invite you to join us on July 18, for our celebration event to promote the creation of an International Day of Education for Global Citizenship through the United Nations system. We believe that such a day is a vital part of fulfilling the UN’s commitment to global peace and prosperity. July 18th marks the date the UN included global citizenship in the language of UN Sustainable Development Goal 4, Quality Education. 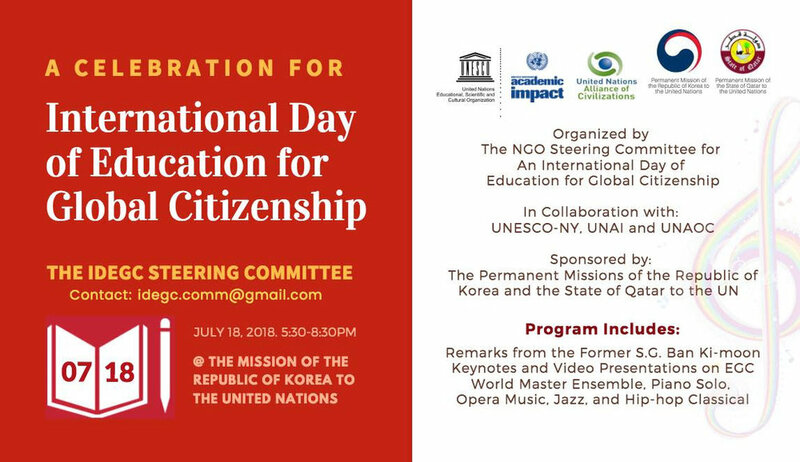 Our celebration recognizes the fourth anniversary of that date and reaffirms the commitment made by the participants of the 2016 Gyeongju UN DPI/NGO conference to establish an International Day of Education for Global Citizenship at the United Nations. Special Advisor to the United Nations Secretary-General Antonio Guterres.